Update 6/29/17: McMansion Hell is out of legal hot water. Read the latest here. Update 6/27 /17: This post has been updated with comment from Zillow. A popular blog that skewers McMansions has temporarily shut down after receiving a cease-and-desist letter from the real estate site Zillow. 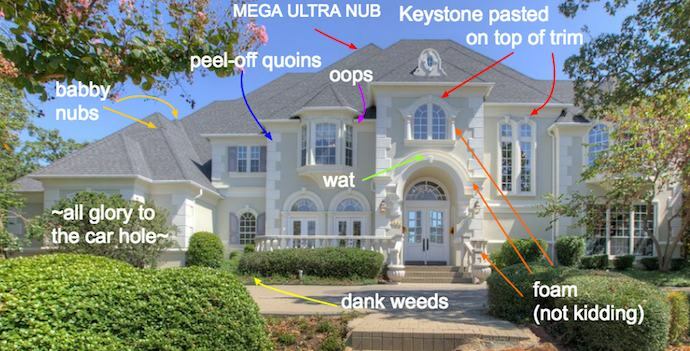 Kate Wagner started her blog, McMansion Hell, as a way to reveal (and revel in) the contradictions of America’s aspirational domestic vernacular architecture post-1980. Specifically, she focuses on homes whose vast floor plans display luxury more than halfway down the road to ungainly excess: A typical post may feature fake columns sprouting around turrets and picture windows that shelter vast marble kitchen islands, double-sized foyers, and Trumpian glass chandeliers. A graduate student in acoustics at Johns Hopkins, Wagner taught herself about architecture, often using images from real estate sites to show readers how we got from this to this. In response to the missive, Wagner issued a statement, below, on the potential impact of shuttering McMansion Hell (right now, it’s not dead; the domain is offline as Wagner archives content). She is currently seeking legal council. [We] do not own the rights to many of the photos on our site, and therefore can’t give permission for third parties, such as yourself, to take the photos from our website for any purpose. We get them from brokerages and MLSs who are advertising homes for sale and through those agreements we have an obligation to protect the interest of the copyright holders who license the images to Zillow. Today on Twitter, Wagner said that a new post, using images in the public domain, will be up this Saturday. Y’all, I’ll be back on Saturday. The post I’m doing for Looking Around is using Public Domain images from the LOC. May 23, 2018 How can architecture criticism give everyone a seat at the table? May 22, 2018 How has the internet changed architecture criticism? May 21, 2018 What do architecture critics think of the state of architecture criticism today?